Crete, the largest of the Greek islands, has had a fascinating history, and every square foot of it has a story to tell. 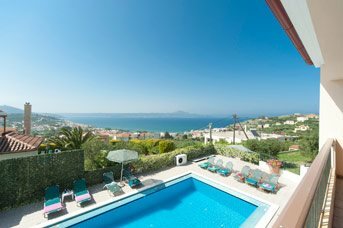 A Villa Plus holiday provides a fantastic base from which to explore this rich island. You will relish the exceptional climate, dramatic scenery and spectacular coastline. Explore lovely beaches, fascinating towns with interesting history and architecture influenced by both the Venetians and Turks, and many delightful little villages and hamlets. The main towns have all you need if you can tear yourself away from your private pool, including great shops and restaurants. Chania is a place of two halves: the buzzing new town and the atmospheric old town, with well-preserved reminders of its Venetian and Turkish past. Rethymnon has a romantic harbour and old town with great seafood restaurants and buzzing nightlife. The huge, central sandy beach is a hub for water sports galore, and impressive mountain scenery behind offers charming villages to explore. Enjoy the sublime Greek cuisine! 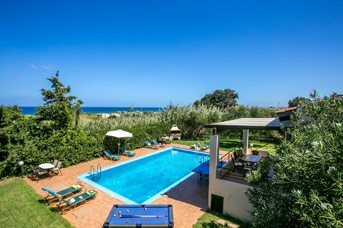 If you just want to relax under a brilliant blue sky, you’ve come to the right place – the beaches of Crete are spectacular, and your own pool at the villa is quiet and private for soaking up the rays. Or you may prefer a really active holiday, trying some of the many water sports on offer, or exploring the island, perhaps walking through the spectacular Samaria Gorge - the longest gorge in Europe. In the evening you can head for the harbour in either Chania or Rethymnon and eat luscious seafood or classic Cretan dishes such as prawn saganaki, lamb antichristo and boureki by the waterside, in the most romantic of settings. There are many more excellent tavernas and bars as well as interesting, independent shops to discover in the lively little streets between the harbour and the town centre. 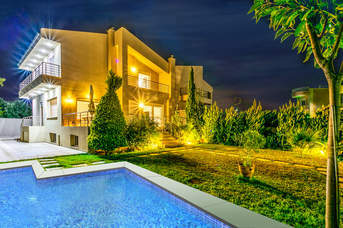 You can choose any one of our villas in Crete and enjoy a holiday you will dream about for many years to come! Our philosophy is simple. We want you to be happy. We want your villa holiday in the sunshine to bring a smile to your face every time you remember it for the rest of your life! So we pay attention to detail. We listen to what you tell us you want, and how we can make your experience even better. And if things do go wrong, we have someone on the spot who speaks your language and can sort out the problem – fast. We describe our villas and our resorts as honestly as we can, and will be happy to help you choose according to your circumstances and preferences. Our villas give you a brilliant base from which to explore, or a luxury home from home you need hardly leave at all! But if you do go on an adventure, you will return to a beautiful house with everything you need to be happy and comfortable, and a lovely, cool calm bedroom will be waiting for you after the heat of the day. Chania, Crete’s second biggest town is on the North West Coast which is the greenest part of the island. The town is surrounded by a landscape of fertile plains, dramatic mountains, deep gorges and lovely beaches. It is a place of two halves: the buzzing modern town and the atmospheric Old Town, with well-preserved reminders of its Venetian and Turkish past. The ancient Venetian-style harbour with its lighthouse and fortress draws thousands of visitors to the town every day during the summer season. This is a great place to enjoy classic Cretan dishes and watch the sun go down over the water. Rethymnon is an interesting town on the North Coast of Crete between Chania and Heraklion. It has all the right ingredients for your holiday – a rich history and culture, a romantic harbour and old town with great seafood restaurants and buzzing nightlife, a huge, central sandy beach with water sports galore, and impressive mountain scenery with charming villages to explore. Like most of the island, Rethymnon has a wonderful past, and this is clearly reflected in the architecture of the old town, where mosques and Christian churches are next to Renaissance buildings overlooked by a huge Venetian fortress. The Venetians also left their mark in in Arkadiou Street, where they built elegant mansions that reflected their wealth and culture. The town has many interesting shops and great places for a long lazy lunch. The Firkas Fortress at the western point of Rethymnon harbour was built in 1629, but today it is the home of The Maritime Museum of Crete, full of paintings and models of ships, nautical instruments, historical photographs and war relics. Crete was ruled by Turkey until 1913, when the Turkish flag was exchanged for the Greek flag here at Firkas Fortress, when the whole island celebrated the union of Crete with Greece. Kournas Lake, 17 miles west of Rethymnon, is the only freshwater lake in Crete. The little lake is a beautiful sight, fed by streams from the White Mountains that surround it. This important wetland is a protected environment, and home to ducks, eels, water snakes, terrapins, herons and cormorants. Temporary beaches appear in the summer months when the water level drops, and then the sun loungers, umbrellas and pedalos appear. You can make a full circuit around the lake during the summer, which takes no more than an hour. 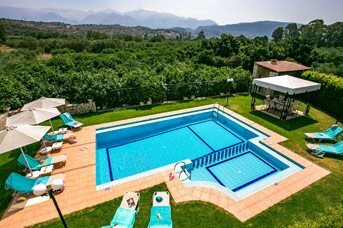 Aghios Nikolaos, on the East Coast of Crete, has plenty to offer for an enjoyable villa holiday. The town has wonderful local beaches, a lake and quaint little harbour, with many good shops, as well as a large choice of cafes and restaurants, all with a friendly, easy-going attitude and great food. Chania, Crete’s second biggest town is on the northwest coast which is the greenest part of the island. The town is surrounded by a landscape of fertile plains, dramatic mountains, deep gorges and lovely beaches. It is a place of two halves: the buzzing modern town and the atmospheric Old Town, with well-preserved reminders of its Venetian and Turkish past. Elounda is located in the east of Crete and north of Agios Nikolaos and south of the resort of Plaka. The village of Elounda offers a wide choice of shops, bars, restaurants and sandy beach, all around a 15 minute drive from the property. Gouves is famous for its Blue Flag beaches overlooked by traditional hilltop village. The area is full of local charm and is great for those looking for a relaxing holiday but with all the resort amenities close by. Old Hersonissos, set in the hillside is a small, well-preserved, picturesque and quiet village with a slow pace of life and a beautiful central square with a fountain in the middle and a church. For something a little livelier, the seaside town of Hersonissos has great beaches to soak up the rays until sundown when the bars open up. The village of Istron is situated 10 miles to the East of Aghios Nikolaos and has 4 beautiful beaches. The village has a few shops for your everyday essentials and tavernas. These facilities fringe the main road which leads from Aghios Nikolaos to Sitia thus making it a great base to explore the Eastern part of the island. Rethymnon is an interesting town on the north coast of Crete between Chania and Heraklion. 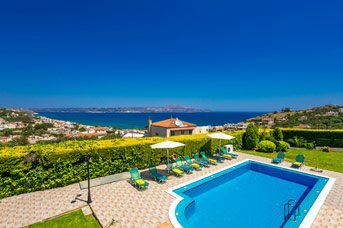 It has all you need for a very special villa holiday – a rich history and culture, a romantic harbour and old town with great seafood restaurants and buzzing nightlife, a huge, central sandy beach with water sports galore, and impressive mountain scenery with charming villages to explore. Crete! The birthplace of Zeus the father of all gods, the island that has been central to films, books and TV series and the place where civilisation was born when the Minoans built stunning palaces with running water and flushing toilets! Whether you’re a culture vulture, a twitcher, a rambler or a disco queen you will always find something which will make a good holiday into a great one! The mild climate in the spring and autumn make it the perfect destination for those who want to go exploring the remote mountain villages and the unspoilt South Coast revealing the rugged beauty many never see. The Mediterranean Sea on the South Coast is always a few degrees warmer and the tavernas will prepare dishes which though simple in their ingredients are eaten only in that area. The hot summer months may make getting around an exertion too tiring! But so many great things are right on your doorstep so just once get up and out early before the temperature soars and revel in a Crete experience! This sacred place, about 14 miles south of Rethymnon, is now a peaceful oasis of flower-filled courtyards and golden stone buildings so it is hard to imagine what took place here. If you have the stomach for it there is a display of the skulls of some of the victims and you can see the roofless room where the explosion took place. A very lovely 16th-century Venetian church survived unscathed and there is also a small museum explaining the history of the monastery and the battle for independence. Limnoupolis Waterpark is set in landscaped gardens with a 1,500-square-metre swimming pool at the centre complete with pool bar, Jacuzzi and a little island that you can get to by swinging across a rope bridge. This waterpark is ideal for younger children, and for you there are sunbathing terraces, cafes and bars. The park has its own river with caves and waterfalls and next to the main pool is a children’s version. There is also a playground for any child who prefers to stay dry. They can play Tarzan on assault courses, have a go at riding mini-motorbikes or play soccer. The “water” part of the park includes rides such as Triple Twist, the Black Hole, the Giant Slide and the churning waters of the Crazy River. Limnoupolis Water Park is near Varipetro, 5 miles from Chania, and it’s open from May to October. Crete has some brilliant markets. The most popular street market in Chania is the ‘Laiki’ on Monday, Wednesday, Thursday and Saturday. The Laiki is like a farmers’ market, where growers and producers come to sell their produce on trestle tables with maybe a tarpaulin for shade. You can buy fresh, locally grown fruit and vegetables, eggs, cheese, herbs, fish, honey and raki. The Agora is an indoor market with proper shops selling all kinds of things including meat, a wide range of fruit and vegetables, cheese and yoghurt, herbs and spices. It is all under one roof in an enclosed building in the shape of a cross, in Odos Minoos, near the eastern fortification wall. The market was completed in 1913, based on the market of Marseilles. The shops are not at all geared up to tourists, but are very much for locals, and so offer an insight into the “real” life of the island. There are also several quaint or small restaurants cooking simple but tasty food. The spectacular Samaria Gorge is quite the challenge – beginning at the plateau of Omalos it is 11 miles long – the longest gorge in Europe. But despite the fact that this is a serious hike, over 170,000 people successfully trek through this mighty ravine every year. It should take about 6 hours if you are reasonably fit. You begin the trek in the White Mountains, above the Xyloskalo staircase, which zig-zags down 700 feet into the gorge. Then you just keep walking, admiring the goats, little chapels, wildflowers, amazing birds and shady pine and cypress forests along the way, and quenching your thirst with clear, cold spring water. At its narrowest point, the 1000 foot walls of the ravine are just 3 feet apart – so breathe in! What better way to spend your holiday than in the turquoise sea waters on the island of Crete. If that was not enough then you can take a stroll on the golden sand whilst breathing in the sea air. There are many beaches in Crete for all the family and friends to enjoy from the North Coast stretching right across to the South Coast. This is a quiet beach but sun beds and umbrellas can he hired from the hotels and some hotel facilities can be used. Watersports are also available at one of the nearby hotels. This is also an area where the Loggerhead turtles lay their eggs so visitors are respectfully asked not to touch the cages covering the nests during the hatching period. Aghia Marina Beach is located on the Northwest of the island. The beach has crystal waters and a long sandy beach for everyone to enjoy, there are also beach bars and tavernas. A very popular beach in the village which has one long sand and shingle beach as well as a smaller more sheltered cove. Both have sun beds and umbrellas for hire and water sports are also available on the main beach. Tavernas, shops, bars and cafeterias are all close at hand. This beach is located just east of the town of Aghios Nikoloas and is reached by taking the Old National Road. It is also a Blue Flag beach and is shallow so popular with young children and people with mobility problems. Sunbeds and umbrellas are available for hire and a few cafeterias nearby are available for snacks and meals. The small village of Bali is a half hour drive from Rethymnon and offers lovely coves which have facilities close at hand. Although access into the water is pebbly, the wonderful crystal water makes this a wonderful place to swim. The village also boasts some of the best fish tavernas. This is arguably one of the most beautiful beaches on the whole of Crete. Boat trips are also an enjoyable way to get to this beach. When viewed from the hills above, it can be seen as a wide sweep of lagoon with soft white sand, sandy seabed and very shallow turquoise waters. From just west of Chania, the long beach continues pretty much uninterrupted except for a few rocky outcrops all the way to Kolymbari 14 miles to the west. Some are sandy, some are with shingle whilst others are pebble beaches. The one thing they all have in common is the wonderful clear waters with every shade of blue. Falasarna, near to the village of Platanos this fabulous beach has a few sun beds and umbrellas but is largely unspoilt. Due to the lack of public transport the only way to reach the beach is by excursion or private transport. The golden sandy beach and turquoise water make it an idyllic location. This is a quiet mainly shingle beach which has little in the way of sun beds and umbrellas and so attracts people who want to be able to relax in peace. A couple of tavernas can be found serving local dishes and drinks but otherwise it’s best to take your own refreshments. The water is clear. Iston Bay is located on the north-east coast of Crete, set in its own beautiful private bay it stretches for 600 meters and has clear blue sea and water activities. Kalathas Beach is located in the northeast of Crete and is in a large natural bay on the Akrotiri peninsula. The beach has lovely golden sand and crystal waters which are lovely to take a dip in or a swim. Although not a large beach, it is very attractive and well organised. The beach is sandy and tavernas, bars and cafeterias all jostle for business. Beach beds and umbrellas are available to hire. There is a car park next to the beach so you do not have to walk far which makes this beach very appealing to those who like to take airbeds and such like to the beach. Kavros has an amazing beach that has a long coastline that stretches from Georgioupolis beach and ending at the east to Episkopi. The sea is nice and blue and has golden sand - great for all the family to enjoy! This beach is 1km west of the village of Kalives. It is well organised and offers a sandy beach with gently sloping access to the sea. It is comparitively quiet and is popular with families as there are tavernas and ‘kantinas’ – usually caravan type vehicles which serve drinks and snacks – close by. The river Kiliaris bisects the beach as it allows the melting snow to flow into the sea. Kolymbari sits in the northwest coast, there are cliffs to one side and the Mediterranean Sea on the other. The beach (which is blue flag) is ideal for a relaxing sunbathe and a swim in the clear blue sea. The seaside resort of Loutraki is located 16km east of Chania, near to Souda. Loutraki is a small beach with crystal clear water and a beach bar. This is a fairly small compact resort which attracts mainly families and this is reflected in the beach facilities. Here sun beds and umbrellas are available but water sports are not which makes the beach safe for small children to play as it is much quiter than some of the other resorts. This is just one part of a long beach which stretches from the area of Petres all the way to the village of Georgioupolis a distance of approximately 16 miles. A few tavernas are dotted along the beach and some offer sun beds and umbrellas for hire but it is generally there are few facilities available. However on calm days there are few other beaches which offer such perfect swimming conditions. This busy resort has water sports, sun beds, umbrellas, lifeguards, bars, tavernas and so the list goes on so overall everything that you could expect from a lively beach. The beach is mainly sandy and the sea bed slopes gently so making it good for children. This is a very large beach offering something for everyone. It is mostly sandy with the side nearest to the harbour offering shallow water whilst the eastern side is shelving a little more but the beach is very popular with both locals and tourists. All facilities are available so a day out combining sightseeing and sunbathing is easy to acheive. Start Beach is at the eastern end of Hersonissos and is sand and pebble. This beach is where Star Beach Waterpark is. There are several unnamed coves after Star Beach which has sunbeds and umbrellas. These tend to be more suited to families and are reached by a short rocky path. Agios Panteleimonas gets its name from the pretty Church of Saint Panteleimon, built on the headland overlooking the bay. This sandy, Blue Flag beach has sun beds and parasols for hire and is also regarded as a great spot for windsurfing. The calm clear waters also mean that Agios Panteleimonas Beach is a great place for snorkelling on the rocks that flank the beach. As with most Mediterranean cuisine, the best way to make Greek dishes is by using fresh local produce, and the best place to go to get it is at the local markets. Deliciously fresh, vibrant and flavourful ingredients can be bought for the best price at markets in Crete, and the experience of wandering through amply stocked stalls is a sensory adventure into the local culture. Markets in Crete open at 7am and usually run until around 2pm. Rethymnon is the largest market in the area, and is held in the town centre car park every Thursday. Here you'll find a vast array of fruits, vegetables and cheeses, as well as locally produced honey. Crete is particularly proud of its wild greens, or horta, which consists of hundreds of varieties of edible weeds. These became the staple diet of many Cretans during the Second World War, and have remained a popular part of Cretan cuisine ever since. Chania and Heraklion markets are both held on a Saturday, where you'll find the same great selection of fruit, vegetables and cheeses as at Rethymnon. Heraklion also sells a huge variety of meats as well as other wares, making it a great place to browse and pick up a souvenir or two. Cretan dishes are heavily influenced by Greek cuisine, and you'll find well known favourites like hummus, tzatziki and moussaka on plenty of menus on the island. There are, however, some dishes that are local to Crete, so if you want to truly immerse yourselves in Cretan culture, sampling some of these local favourites is a must. 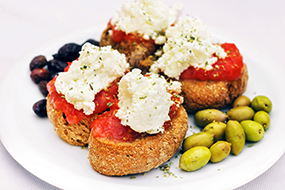 Our Crete Guide is a good place to start if you want to find out more about Cretan cuisine. A Cretan staple which accompanies a multitude of dishes and meals is paximadia – twice baked bread which varies greatly from tough, hard slabs to small sweet biscuit-like bites that are flavoured with cinnamon and nuts or raisins. Paximadia is usually softened with oil, sauce or juices from the dish it accompanies to make it more palatable. Dakos – soaked dried bread topped with chopped tomato. Xinomizithra – a creamy, soft white cheese which is salted and aged for a tangy flavour. Kalitsounia – small cheese and herb pies which vary in stuffing and seasoning from region to region. Some are drizzled with honey for a sweet and savoury flavour contrast. Cretan cuisine focuses on bringing out the unique flavours of fresh ingredients. 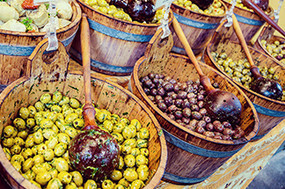 As such they are rarely seasoned with spices – instead, fresh herbs are used, and flavour combinations are valued highly, such as sweet and savoury, bitter, tart and sour. If you'd like to experience Cretan cuisine before you arrive on the island, these recipes are authentic and simple to make at home, with ingredients that can be found at your local supermarket. This is a traditional Cretan dish not unlike an omelette. Made with tomatoes, courgettes and eggs, it is often served as an appetizer but would make a great breakfast alternative or a healthy lunch. Heat the oil in a frying pan. Add the onions and courgettes and cook for around 10 minutes, until the onions are soft and golden brown. Stir in the chopped tomatoes and season with salt and pepper. Reduce the heat to simmer and cook until almost all the liquid has evaporated. Add the eggs and simmer for a few minutes, until cooked. The name of this dish translates to "roast fish with oregano and extra virgin olive oil" and making it is that simple. You can use any white fish of your choosing, as long as it is fresh. 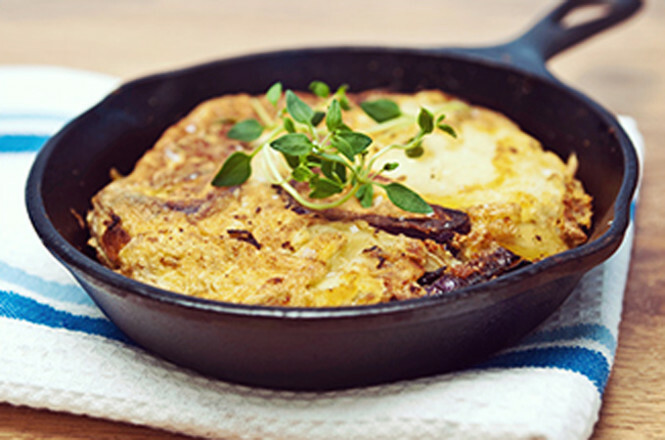 This dish is best served with a salad of fresh green leaves and a crisp white wine. Peel and slice the potatoes, slice the fish in half and place in the baking pan with the potatoes around them. Season well with salt, pepper and oregano. 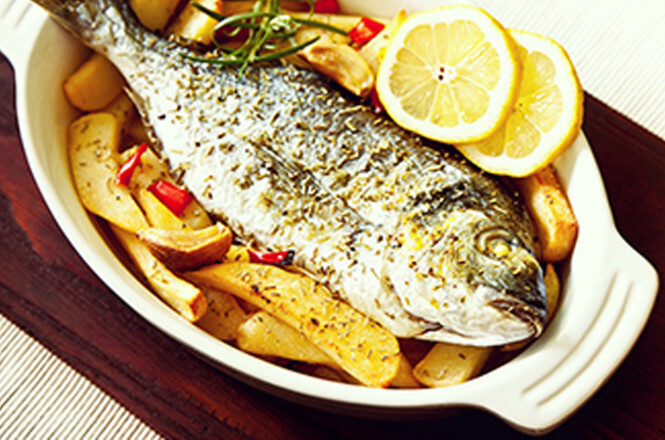 Combine the olive oil and lemon juice in a sealable jar and shake well to combine before pouring over the fish. Bake in the oven at a medium temperature for around an hour, or until the flesh is flaking from the backbone of the fish and the potatoes are thoroughly cooked.